Domains need to be renewed regularly if you want to continue using it for your website or if you want to keep it in your portfolio. You can renew a domain for a minimum of 1 year and up to a maximum of 10 (you cannot exceed 10 years). From the top menu, click the My Domains to the top right. On this page is a list of all the domains in your account. 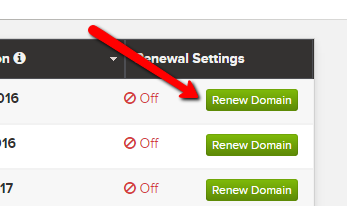 Click the Renew Domain button to the right of the domain names you would like to renew. Either click the Checkout-button or the Cart on the top right of the page to proceed to the Checkout Page. Select a method of payment and follow the instructions to complete your renewal transaction by clicking Complete Order. If a domain name is not renewed it will disappear from the account. However, if you accidentally let a domain name expire that you really want to keep, we may be able to restore it for you.